Maximize your hospital evaluation system. Hospital emergency rooms and anesthesia departments are busy but important learning environments. We enable attending doctors to quickly and easily evaluate trainee doctors (and vice versa) at the end of every shift. Our CanMEDS compliant and RIME compliant evaluation system eliminates manual input and data collection with customizable online course evaluation forms for medical students. You'll get a rich set of reporting and exporting capabilities, a personalized dashboard, mobile device support, and automated notifications that protect the anonymity of evaluators. With the shift from an all-paper system to an online system, not only has it greatly reduced the administration burden for my team, but it has also increased compliance rates from 60% to 95%. We are incredibly pleased with it. It reduces the time I have to spend collecting all the data, reading and deciphering handwriting, and retyping everything. It's a huge time saver. It's also nice that the learner can evaluate the educator. It really helps with faculty development. Doctors receive automatic e-mail notifications and reminders so that evaluations won't get missed. Filter by date, doctor, and education level. Export the results for spreadsheets, print, and more. Users see only relevant pending evaluations. 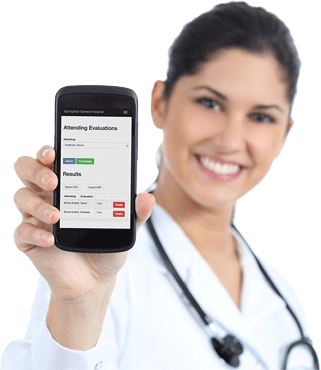 Doctors can access the site on their phones, tablets, laptops, or desktops. * Includes standard evaluation form, hosting, support, and SSL certificate. 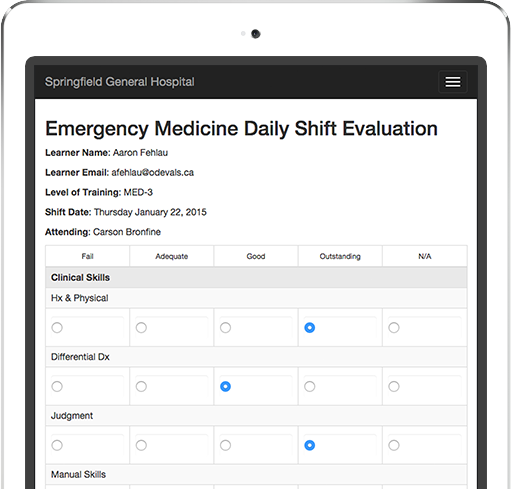 Revolutionize the way your hospital does evaluations. Let’s schedule a demo.